The Orillia Opera House, was originally built in 1895 at a cost of $25,000. The building served multiple purposes (auditorium, City Hall offices, Council Chamber, market stalls and a lock up). The auditorium had a balcony similar to those found in formal opera houses in Europe. In July 1915, a fire destroyed most of the building. The city council presented a $50,000 plan to rebuild which was turned down by residents who felt it was too much money to spend on a building during the war. Another plan was offered and approved for $35,000 and work completed in 1917. From the 1920’s to late 1950’s the building was a movie house on Saturday afternoons. Over the years, it also hosted numerous concerts. Great performers such as Bob Hope, Glenn Gould, Leonard Cohen, KD Lang, Blue Rodeo, Bruce Cockburn, Anne Murray, Rita MacNeil, Serena Ryder and Gordon Lightfoot have graced the stage. In honour of hometown boy, Gordon Lightfoot, the Orillia Opera House renamed its auditorium after him on October 18, 1997. In 1978, it was designated a heritage building, largely because of the slate roof and cultural significance to the city. In 2013, city politicians budgeted $250,000 to replace the damaged wood and slate turrets. Because of the expense and historical significance of the building, care was taken to hire the right professionals for the job. Part of the selection process required the roofing contractor to provide five job references in the past three years. 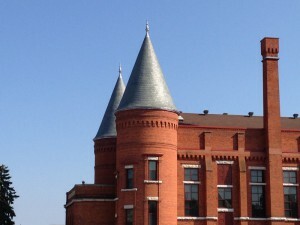 Installed correctly these beautiful turrets will last between 75 to 100 years. Twenty seven squares of our North Country Semi Weathering Green were supplied for this project. A percentage of these slates will weather to tones of brown over time. 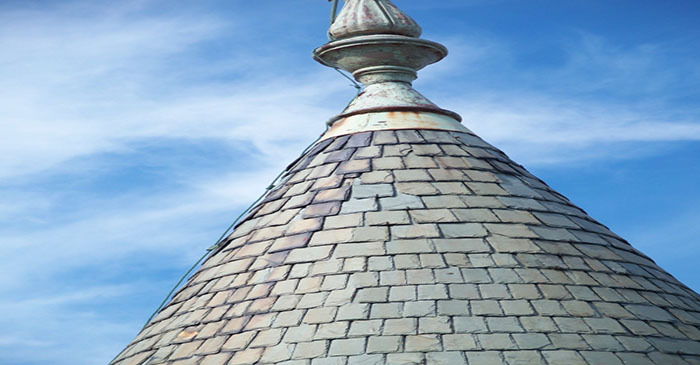 This slate meets or exceeds ASTM standards as an S1 rated roofing slate.